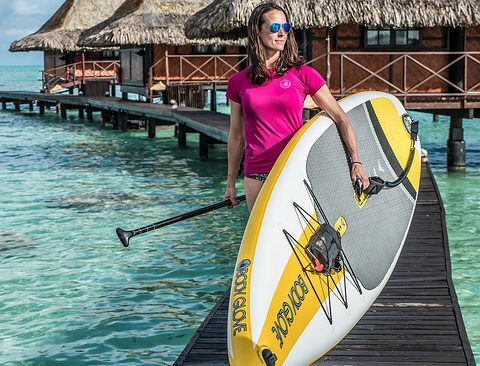 Stand-up paddleboarding has become one of the fastest growing recreational sports in America, and there are few better ways to catch onto the craze than with the Body Glove Performer 11 inflatable SUP. This smart and super convenient setup includes a hand pump, three-piece paddle and carrying case that can be worn like a backpack, opening the possibilities of adventurous stand-up paddleboarding whenever you strike a notion. Just throw the whole case, about the size of a suitcase, into the trunk of your car and you’re ready to go. Once this board is inflated, though, you’ll hardly notice that it’s filled with air as it performers like any solid body SUP might. It’s also a fair bit lighter than an average board about the same size making it easier to wield getting in and out of the water. It’s grip pad that extends along the surface of the board provides a cushy surface that assists balance. Another nice feature with the Performer 11 is the patented handle designed to make it easy to both carry the board and the paddle at the same time. The handle itself has a velcro strap that secures the paddle as you make your way to the water. The board also has a sleek shape allowing it to cut through the water and turn nicely. There are bungee straps on top to store gear and a leash. We did notice that in storage the permanent rubber fins on the board tend to bend. This can be problematic in the water, but we found that if you leave the board out for a short period these indestructible fins naturally regain their shape. For this reason, it’s ideal when you can store this board fully inflated and only deflate it when you absolutely have to. The Body Glove Performer 11, as is the new Raptor inflatable SUP due out in 2017, was designed by paddling legend Luke Hopkins. Everything from the paddle to the concept and manufacturing was personally overseen by Hopkins with a special eye toward price point. At $899 for the Performer, we’d say that’s quite a deal. 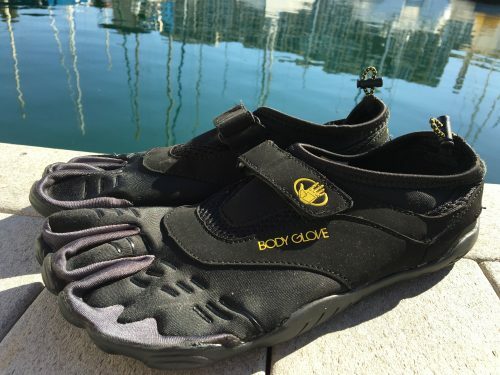 For more on the water shoes click here. For more on the Body Glove Performer 11 click here.